It's been one of those days when nothing is going right. All the kids swim classes were cancelled by accident so we had to re schedule each one week by week, then tried to hit up our favorite lunch spot to find that it wasn't open and just knowing that tomorrow is Monday again is putting me in one sour mood. 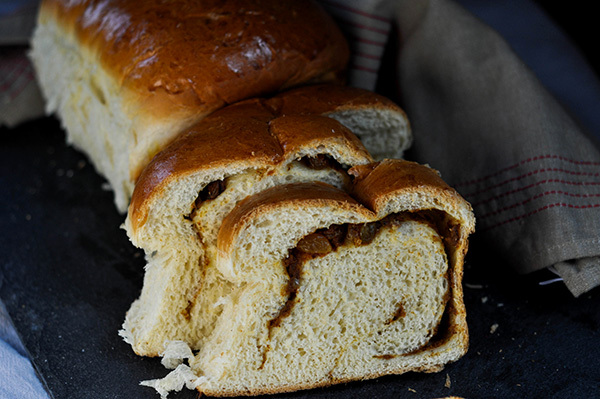 I'm hoping that making a fluffy loaf of Pumpkin Raisin Milk Bread would put me in a better mood. I debated breaking out the Tsangzhou starter method again, but my Sunday afternoon laziness kicked in and I decided to go with the easier Woks of Life method using heavy cream and cake flour to produce a super easy and fluffy loaf. There's just too many other things to do. Making dinner, prepping lunches and breakfasts for the week. It's all too overwhelming to try and cook a starter. Maybe I should call this lazy Sunday milk bread. It starts with the easy milk bread recipe from The woks of life, but modified it a bit with an extra egg and more flour. All the ingredients go into a mixing bowl and mix on low for 2-3 minutes, till it's all combined. Then I like to bring it up to level 4 and knead for 13-15 minutes. Once its done, check to make sure you get the windowpane in the dough. Take a piece and stretch it out between 4 fingers to see if you can get it thin enough to see light coming through. If so, you're good to proof! Cover it with plastic wrap and leave in a warm place for an hour. I use the proof function on my oven. While it's proofing, I make the pumpkins filling by mixing together the pumpkin, spices and a bit of brown sugar. After the dough has doubled in size, punch it down to deflate the air then turn it out onto a clean board. Cut the dough into quarters and leave the unused half covered while you shape the first piece. Click the image below to see the steps! Roll the dough out into a rectangle . Spread the pumpkin filling all over the surface of the dough and sprinkle on the golden raisins. Fold the long side of the rectangle into thirds. The top folds to the middle then the bottom also folds to the middle. Spread more filling and raisins then from the short side of the rectangle, roll it up and place seam side down into one side of a buttered loaf pan. Repeat with the remaining dough and place on opposing sides of the loaf pans. Allow to rise for 45 minutes or until the dough is puffy and are touching each other in the loaf pan. Brush with egg wash and bake for 25 minutes. Allow to cool slightly in the pan then turn out onto a wire rack to cool completely. Thought I must admit I like eating this warm! Perfect for a cool fall day! In the bowl of a mixer, add ingredients in the following order: heavy cream, milk, egg, sugar, cake flour, bread flour, yeast, and salt. Use the dough hook attachment, and turn on the mixer to “stir.” Once the ingredients come together to form a ball (approx 2-3 min), I sped it up to level 2 on the mixer and Let it go for 13 minutes. After 15 minutes of mixing, and the dough smooth, it is ready to proof. Cover the bowl with plastic wrap and place in a warm spot for 1 hour. The dough will grow to 1.5X its original size. While it's proofing butter 2 loaf pans and make the pumpkin spread by mixing the pumpkin puree, sugar, cinnamon and nutmeg together until well combined. Cover the rest of the dough while you work with one. Roll out one of the dough balls into a a 8X4 inch rectangle. Spread the pumpkin spread on the dough and sprinkle with raisins. Then fold the shorter top half to the middle and then the bottom half to meet in the middle. Spread some more pumpkin onto the dough and sprinkle more raisins. Then from the side that wasn't folded roll the dough to create a fat cigar. Place this seam side down on one side of the loaf pan. Repeat with a second dough ball and place on the opposite side of the loaf pan. 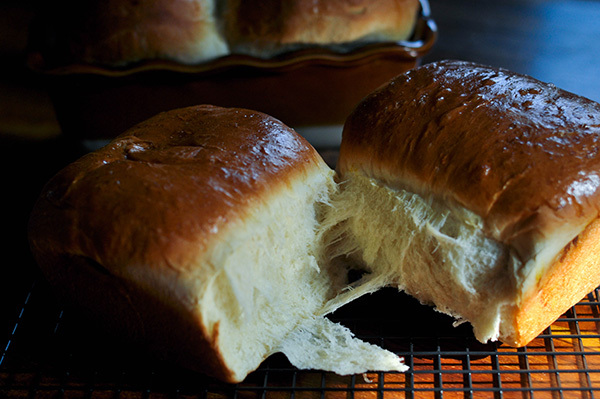 Allow to rise for 45-60 minutes; until the two rolls expand to meet in the middle. Preheat the oven to 350F. Brush the tops of the loaves with egg wash and bake for 25 minutes.